As many of you have noticed, our schedule has had quite a few cancellations lately. I apologize if any of the classes may have been ones you wished to attend- please know that these cancellations have been due to low enrollment. We are NOT downsizing our schedule. You all know that we are a very small program, and I have received many emails in the past few weeks from those of you on vacations and out of town for the weeks ending summer. We leave classes open for registration up to 6 hours prior to the class start time; so chances are if you notify us of your plans to take any class on the schedule prior to that 6 hour window, your class WILL run as scheduled. As always, if you have any questions or concerns about our schedule, please don't hesitate to call or email us! So yesterday as I tried to find a place to grab some quick lunch, I wandered into this rather massive sandwich/soup/salad shop in CC, Brodo. 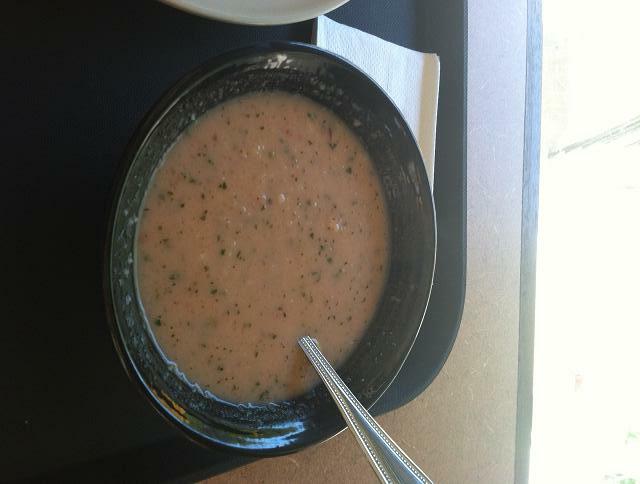 I had been craving some soup for a while, but its been too hot for anything but a cold one. I'm a little wierd with cold soup, as it has to be pretty special for it to wind up in my bowl. Brodo had me pretty intrigued with their watermelon habanero soup. It was so perfect-- not only did it rep bodyLOGIC in color, but the habanero packed a serious punch-- much like our killer workouts! If you have been to the schedules/reservations page of our website, you will have noticed that scheduling is running a little differently.. much simpler. We have switched to a great scheduling software that will allow you to easily view and manage your schedules with your own online account. You will also have the option to purchase classes online via credit card. You do still have the option to purchase classes in studio with cash or check. By your requests, we have some new class times in Rittenhouse this month: Sunday, 5:15-6:30PM as well as Thursday, 6:00-7:00am Power Hour. These classes will begin the second week of August. 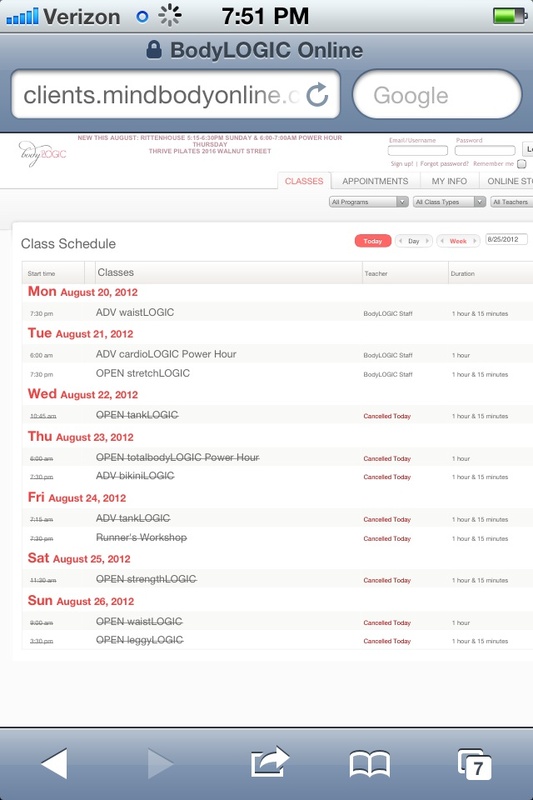 bodyLOGIC will be running on a compromised schedule 7/30-8/5. We will resume with a full schedule on 8/6. Fallon will be teaching all scheduled classes, and handling all things as I normally would. The most accurate version of the schedule will be found on the "Reservations" page of our website (click RESERVE NOW for weekly schedule through the fall). I will be blogging next week, for newbies as well as for those of you "not so newbies". So this weekend we had a really difficult, but equally FUN and scenic first Outdoor class. It was a great workout for all of us! Above is a sneak peak of Old City's Outdoor class scenic views! This class happens in Old City on Sundays, 9:30-10:45am, and will be coming soon to both our Rittenhouse & Fairmount locations. We have added our Runner's Workshop to the next two Fridays in Old City, 7/20 & 7/27, 7:30-8:45PM. The Runner's Workshops will continue through the summer into the fall. We will also be starting our new skinnyLOGIC class in August, a weighted arms and legs super-cardio class. I can't even wait! Hey Ladies-- As promised, the July schedule has now been released. It is quite a nice mix of mornings and evenings in Old City, our Tuesday evening & Saturday afternoon in Fairmount, as well as a Wednesday late afternoon in our new Rittenhouse location. The schedule in all locations will be expanding as the month goes on. I begin an internship with Philadanco on July 9th that I am so excited about! :D I am hoping to begin new classes during the second and third weeks of July. View the July Schedule HERE. **There are 3 locations, and so three different calendars now pull up in the same window. Please use the tabs on the bottom of the page to navigate between each of the location's schedules. SCHEDULE IS EXPANDING! Request New Rittenhouse Class Times HERE. More information coming up tomorrow about Friendly Referral discounts: JULY, Personal bodyLOGIC/lifestyLOGIC promotions (one-on-one class time & goal setting), and other new promotions for our new & existing clients available during this month!